The base of this vase is a light peachy/pink colour. It is 230mm (9") tall. The stem is clear and has a medium flare 28mm (11/10ths inch). 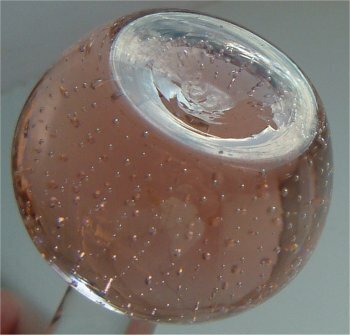 The bubbles are small and come up in a spiral. The bottom of the base is concave (see close up below). The label is small and round and a metallic mid blue, with a 24 point star in silver and the letters JJ in blue in the centre, but unfortunately no other information. Click on label for close up detail. I have no information yet on what the JJ stands for, however I suspect the vase was made in Czechoslovakia.